Harare: Zimbabwe's military action leading to Robert Mugabe's resignation was legal, a High Court judge has ruled, in a key decision as the military seeks to show that its moves were not a coup. Experts said it sets a dangerous precedent for the military to step in again. 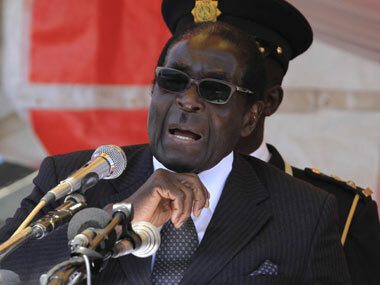 Meanwhile, officials allied with Mugabe were in court on Saturday alleging retaliation after the military stepped in. High Court Judge George Chiweshe on Friday ruled that the military's actions "in intervening to stop the takeover" of Mugabe's functions "by those around him are constitutionally permissible and lawful." The military stepped in almost two weeks ago after Mugabe's firing of deputy Emmerson Mnangagwa amid fears that the 93-year-old president's unpopular wife was positioning herself to take power. The judge said the actions ensured that non-elected individuals do not exercise executive functions, an apparent reference to then-first lady Grace Mugabe. Separately, the judge said Mugabe's firing of Mnangagwa as vice president was illegal. Mnangagwa was sworn in as president on Friday in a whirlwind reversal of fortunes, becoming just the second leader of Zimbabwe after Mugabe's 37-year-rule. The judge's decisions were quickly criticized both by legal and rights experts and by close allies of Mugabe and his wife. "If these breathtaking High Court Orders granted in Harare yesterday represent what is being peddled as a 'new path,' then please pray for Zimbabwe," tweeted minister of higher education Jonathan Moyo, the most vocal of the Mugabes' allies. The southern Africa director for Human Rights Watch, Dewa Mavhinga, called the rulings "incredible" and said on Twitter: "Strange, captured judiciary?" Zimbabwe's military sent tanks into the streets overnight on 14 November, taking control of the state broadcaster and announcing that Robert Mugabe had been put under house arrest. It said it was pursuing "criminals" close to Mugabe accused of harming the country's economy. The military's move led the ruling party to turn against Mugabe, launching impeachment proceedings before Mugabe on Tuesday announced his resignation, while tens of thousands of Zimbabweans took to the streets in a military-backed demonstration urging him to step aside. 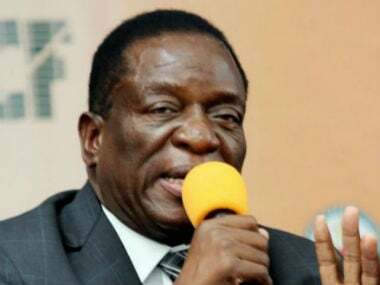 Mnangagwa, who fled the country shortly after his firing, said upon his return he had been in "constant contact" with the military during his absence. Many in the international community have avoided calling the military's actions a coup, instead urging that Zimbabwe's authorities respect the rule of law. Some Zimbabweans have congratulated the military, taking selfies with soldiers and sending up a cheer for army commander Constantino Chiwenga at Friday's inauguration. Zimbabwean lawyer Alex Magaisa said the judge's rulings "may come to haunt Mnangagwa's government" by setting a precedent in "effectively legalizing military intervention in the affairs of government." He also wrote Saturday that "it is interesting to note that the order was granted by 'consent' which suggests that Mugabe agreed to it. 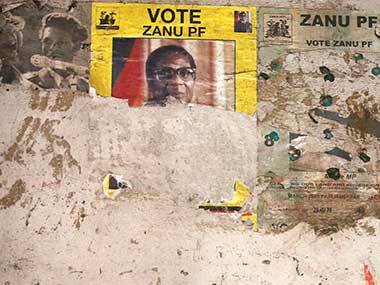 If he did, it could be that it was part of Mugabe's exit deal." 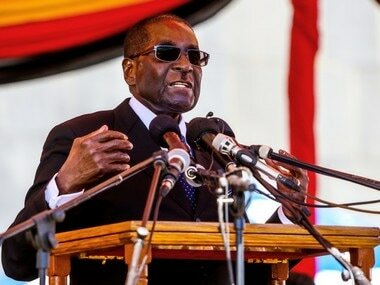 Mugabe has not been seen in public since his speech on Sunday defying calls to resign. He will remain in Zimbabwe, and Mnangagwa met him on Thursday and assured him of "maximum security," the state-run Zimbabwe Herald reported. Mugabe did not attend the swearing-in of Mnangagwa, a 75-year-old former defense and justice minister blamed for a number of crackdowns under Mugabe's rule. 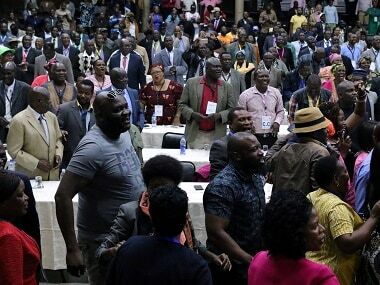 In his first speech as president, Mnangagwa spoke of reuniting the country and reaching out to the world after years of international condemnation and sanctions over rights abuses and allegedly rigged elections. Let "bygones be bygones," he said. He has warned against "vengeful retribution." The legality of the military takeover is also under scrutiny in new cases against several officials linked to the ruling party faction of Mugabe's wife. Their lawyers say they were illegally detained by soldiers for days. Innocent Hamandishe, a member of the ruling ZANU-PF party's youth league who has been linked to a statement critical of the military, was "abducted" on Nov. 16 and only handed over to police on Wednesday, said his lawyer, Emmanuel Samudombe. He appeared in court on Saturday. "It's a serious breach of the constitution," Samudombe said. Charges against Hamandishe include "causing disaffection" in the security forces during the military's intervention. The lawyer described the case as "retribution" but said he would wait to see how authorities deal with it in light of Mnangagwa's comments urging Zimbabweans not to settle old scores. "Change is good, the change is proper. But we feel that there's a dark side to it," the lawyer said of the charges. "There's something fishy in the whole matter." Other officials facing charges include Finance Minister Ignatious Chombo and Kudzanai Chipanga of the ZANU-PF's youth league. Chombo appeared in court on Saturday after accusations of corrupt land deals dating back to his time as minister in charge of local government, his lawyer Lovemore Madhuku said. Chombo was assaulted after the military moved in and illegally detained for more than 48 hours without being brought to court as required by law, the lawyer said, and is now in police custody. Charges against him were read out Thursday while he lay in bed at a government-run hospital, his lawyer said. The lawyer for Chipanga said the youth leader was removed from a police station by "armed people" on 15 November and tortured, and he wasn't brought to court within 48 hours. He was arrested by police on Thursday. "The military must know that there is a constitution in this country," Lovemore Madhuku said. "There's no such thing as a military arrest." Whatever one might think of coups in principle, "one would have to concede that this one was artfully contrived and executed," showing a "smiling face" to the world to avoid regional sanctions, wrote Peter Fabricius, a consultant with the Institute for Security Studies. Mugabe had the chance to protest to South African envoys who met with him shortly after the military stepped in, Fabricius added. "Mugabe could have screamed 'Help!'" But he didn't, South Africa's defense minister later told local Radio 702, "Well, according to Mugabe, nothing; he's happy," she said.